An astonishing 101-year-old player from Braehead Bowling Club was a major star of Friday night’s Clydesdale Sports Council Sports Personality of the Year Awards. Centenarian Davie Thomson, of Forth, was announced as the recipient of a Special Recognition Award which he received from Clydesdale Sports council chairman Millar Stoddart at the Cartland Bridge Hotel. Former miner Davie, who continues to play in Clydesdale Sports Council’s carpet bowls programme, told Gazette Sport: “It’s a surprise to win this award. I never thought I would get it. “I only found out a fortnight ago that I had been invited to this ceremony. “I didn’t start playing bowls until I retired and I’m still playing yet. “I was a golfer before that. “I’ve kept myself fit. I used to do a lot of exercise including running. “I’m in the running to win the shield at Braehead this year. Davie – who was recognised by the Queen on his 100th birthday in August 2015 – revealed some aspects of his lifestyle that might explain his longevity. Ironically, Davie is Forth Wanderers’ oldest living supporter and Wanderers gaffer Jamie McKenzie was another standout at Friday night’s awards as he scooped two top prizes. Jamie (36) collected Coach of the Year and Team of the Year honours at Lanark’s Cartland Bridge Hotel in recognition of his side storming to the 2016 McBookie.com Central Division 2 title. The delighted gaffer told Gazette Sport: “We were extremely proud of what we did last year. “It was unbelievably difficult to win the league last year. In the end we made it look easy but we went on a run that was incredible. “Full credit to the squad of players that we had that they went on that run. “Obviously to win Team of the Year with so many good people up for the award is amazing for the club and for the village. “And the personal one was something I wasn’t expecting. I was coming along for the team award because we’d been nominated and it came as a big shock. Wanderers are competing well in the higher Central Division 1 league this season. 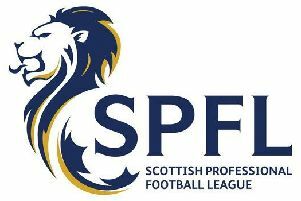 Although they are second bottom and in the relegation zone with 14 points from 13 games, Saturday’s 4-3 win at local rivals Lesmahagow Juniors means that Forth are just three points from safety with games in hand over most of their rivals. “Of course I’m confident we can get out of the relegation places,” Jamie said. “We’ve got lots of games to play. We just hope that time isn’t against us as well in terms of playing too many games in a short space of time.